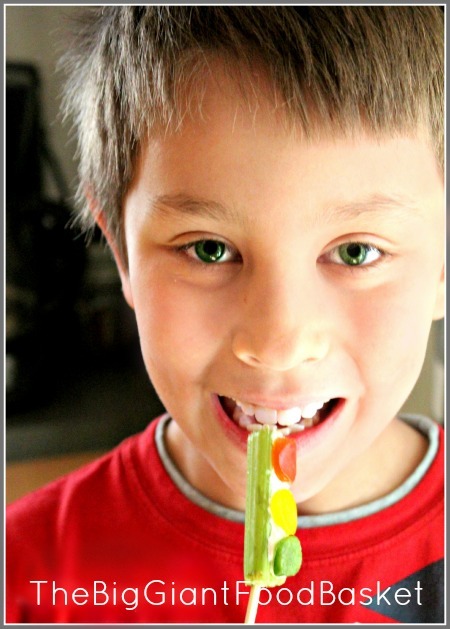 If you have school age children you know how difficult it can be to get them to eat a healthy after school snack. Well I saw this on Facebook today and thought they were the cutest dang things...who wouldn't want to eat one of these stop lights? And as it happened, I had everything needed in my frig to make these. TWO: Cut circles from your bell peppers using a metal Wilton frosting tip. THREE: Pop the circle out of the frosting tip using a sharp knife. FOUR: Place the circles on the the cream cheese. FIVE: Skewer the celery with wood skewer. 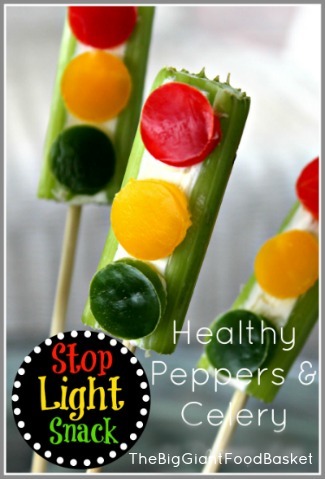 This recipe was found at the Super Healthy Kids website. To see more healthy ideas for kids you can visit their site by clicking here. These look so adorably cute! What a great idea! Thank you for sharing with Foodie Friends Friday! We are sharing this recipe on our FFF Facebook Page tomorrow. We would love for you to come over! Please come back and VOTE on Sunday! Hope to see you this week with another GREAT recipe! I am passionate about food...always have been. And there is nothing I enjoy more than trying out new recipes especially ones with new flavor combinations. All the recipes featured in this blog I have personally kitchen tested. Some are tried and true old favorites, and some I have just stumbled upon. Either way I hope you will find recipes which will both intrigue your imagination and make your palette dance! The Grape Wine Bar, SanDiego, Cal. "The internet has become such a great tool not just for chefs but for everyone. The net has given everyone the tools to see and almost experience new and different ideas."